What made you come and look at this review? Did you anticipate another book refuting the crucifixion or other such notorious events surrounding Jesus? Let me assure you that this book is not about that at all. If anything, this particular nonfiction work is about the curious things Jesus said and did. We may not understand how some of the topics fit under the auspices of the word scandal until you read what David is placing before you and I as food for thought. Within the pages of this short book you will laugh, think, rethink, and maybe learn something new. 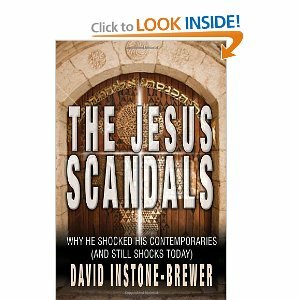 The contents are divided into three parts: Scandals in Jesus’ life, Scandals among Jesus’ friends, and finally Scandals in Jesus’ teaching. We forget that Jesus’ friends, disciples, family, and others also went through various experiences because of who Jesus was and is. As you read through the short chapters, perhaps you will allow your views to be expanded as David expounds on the Scriptures. He brings the culture of then and now into an understanding of what Jesus taught and how we are to be changed by it today. When life gets hectic or even in quiet times, we tend to forget that life isn’t always the same for others around us. When we read the Bible, it may be that we read it with a particular viewpoint that does or maybe it doesn’t coincide with what Jesus actually taught or did. There are some issues raised that have a different conclusion when history is brought into the picture. In other chapters, the Body of Christ is exhorted again to pay attention and heed the Master’s commands. The author hopes that the book will be used to begin conversations with anyone the Lord brings across our path in life. David brings clarity to some parts of Scripture that have been unfortunately not understood completely or not at all. David never writes with a know-it-all style, but a very real down to earth, easy style that helps the reader think about what is being presented. This is perhaps one book you might want to leave in various rooms of your home to be read with a little or a lot of time available. I found myself at times, laughing at something written, other times agreeing, and occasionally not agreeing with the conclusions. The Jesus Scandals is a great book to encourage conversations with others, but not for the sake of creating arguments. I appreciate the ideas, thoughts, and scholarly help contained in the small book and I hope you do too.